The Startup World Cup invites high-growth early-stage startups from all over the world to pitch their innovative business solutions to a well-rounded panel of venture capitalists, angel investors and business development experts, and to compete for investment, maximum media exposure and networking opportunities with enablers and sponsors. Get access to the Match and Invest Lounge, where key funders will be available for consultation. The pitching competition is a platform for HIGH GROWTH and START-UP (EMERGING) companies to pitch their business to a well-rounded panel of judges. 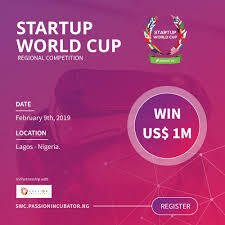 In this way, the Startup World Cup celebrates emerging companies with tech-enabled solutions spanning across all industries. This competition category aims to encourage companies with the best growth potential to become market leaders, and to inspire future entrepreneurs and startups. True success requires vision and leadership, financial accomplishment, strategic direction, and innovation. This competition is designed to recognize and honour entrepreneurs and companies whose innovative tech-enabled solutions will have a significant impact on the growth of the African continent.